Coming in with another slow-cooker recipe for you today. Is it too early for so many slow-cooker recipes at once? I know it’s only September, but I’m slowly getting into the mood for cooler weather and soup season. I made this tomato soup a few weeks ago when I was heading out of town for a work trip. I wanted to leave BL a few ready-to-go meals in the fridge and his first request was creamy tomato soup. He loved that meal so much that I knew I wanted to recreate it again after I got home. This one couldn’t be simpler, but we’ll need to have a conversation around salt. 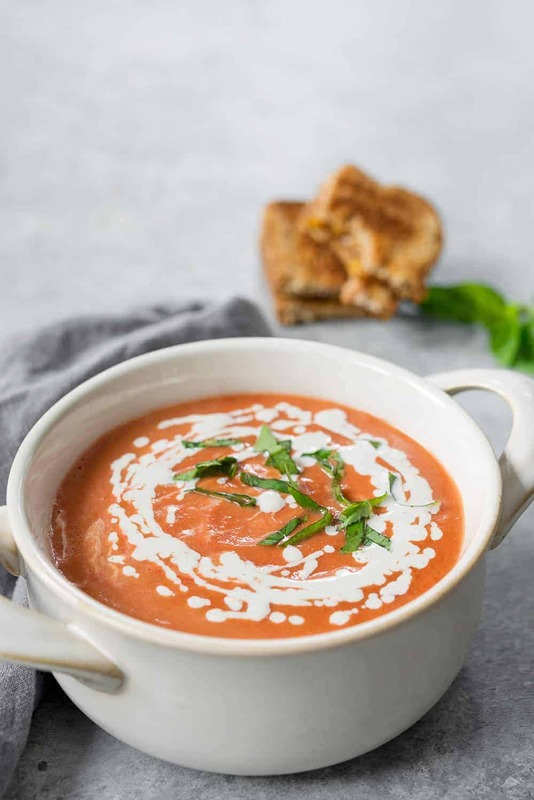 The reason that most tomato soups taste bland is that they don’t contain enough salt. Especially if you are starting with unsalted tomatoes. Don’t be afraid to add some salt to this soup; my rule of thumb is that if you think you are adding too much, it’s probably just enough. Unless you need to be on a low-salt diet, I’m not that worried about salt for the average population in a dish like this. Tomatoes are rich in potassium, the counter electrolyte to sodium. To make this creamy, I stirred in a cashew cream at the end. If you haven’t made cashew cream before, it’s incredibly easy- blend together cashews and water together. That’s it! I usually make a bigger batch than is needed since my blender does better when I have a larger batch. 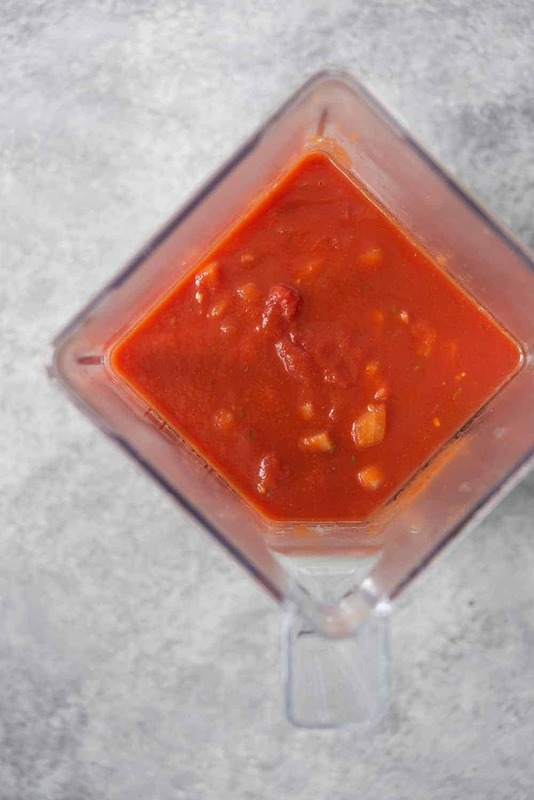 If you have a big blender, then you might need to add more cashews and water to make this sauce. Other alternatives to cashew cream are soy creamer or heavy creamer. 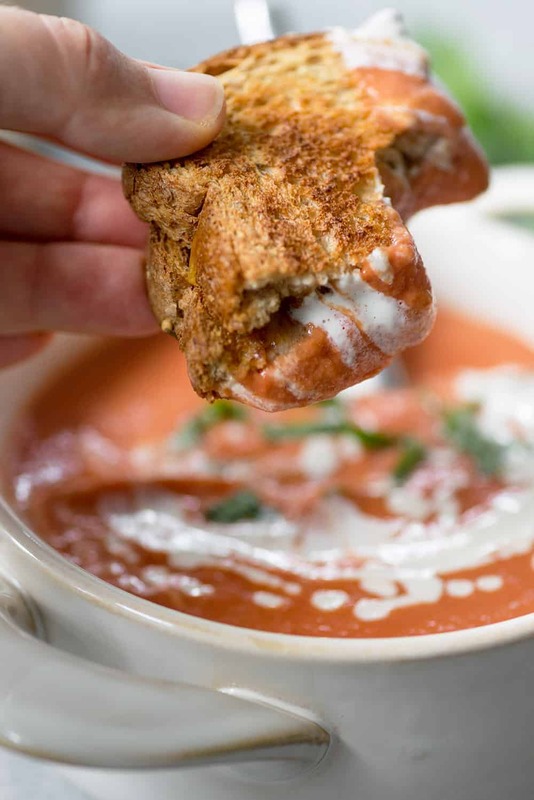 You just need a little to bring this soup together. 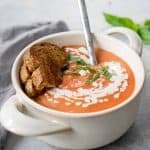 Slow Cooker Vegan Tomato Soup! 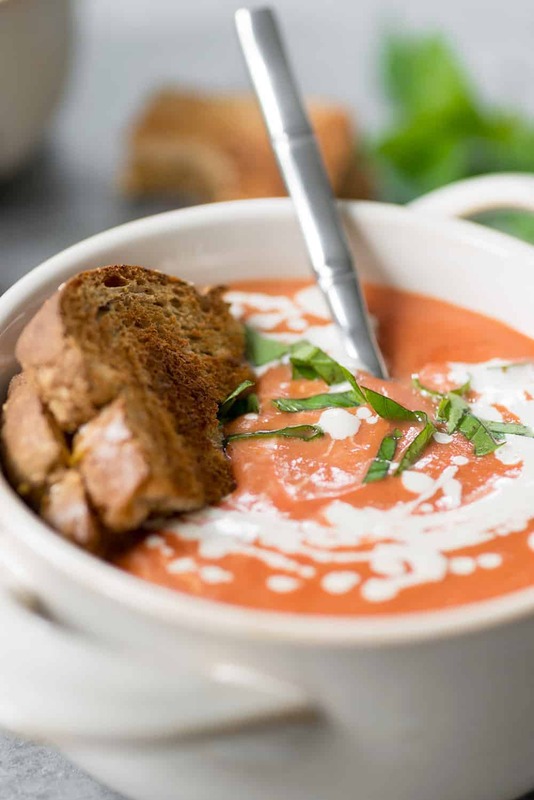 This soup is SO delicious and perfect for fall and winter. Throw it into the slow cooker and dinner is served. Creamy and delicious. 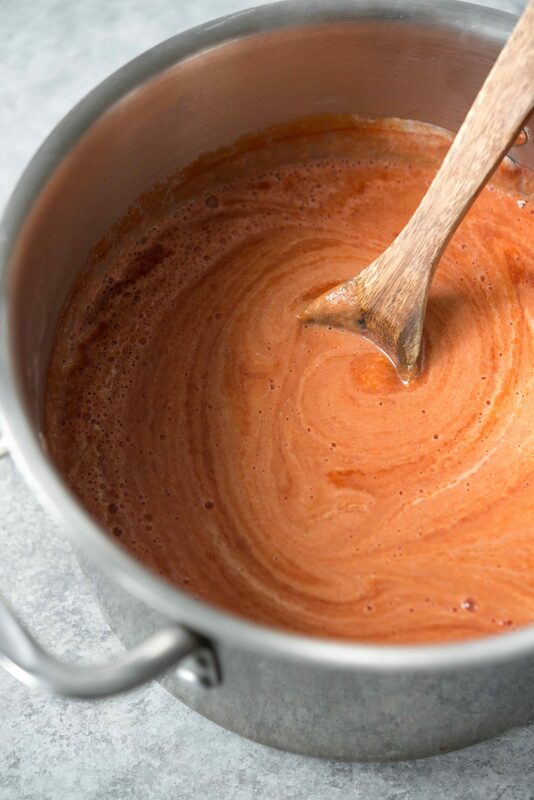 Place the canned tomatoes, sauce, broth, garlic, onion, oregano, sugar, salt and pepper into the base of a slow cooker and cook on high for 4-5 hours. Taste and adjust seasoning as needed, you may need more salt/sugar depending on the canned tomatoes. Stir the cream into the soup and the basil. Eat! OMG, Alex, what a gorgeous soup!! I firmly believe, tomato + basil is the best flavor combo in the world. My family loves this recipe! So easy and delicious! Hi Sarah- so glad you like it! It’s one of our favorite’s as well! making this now! 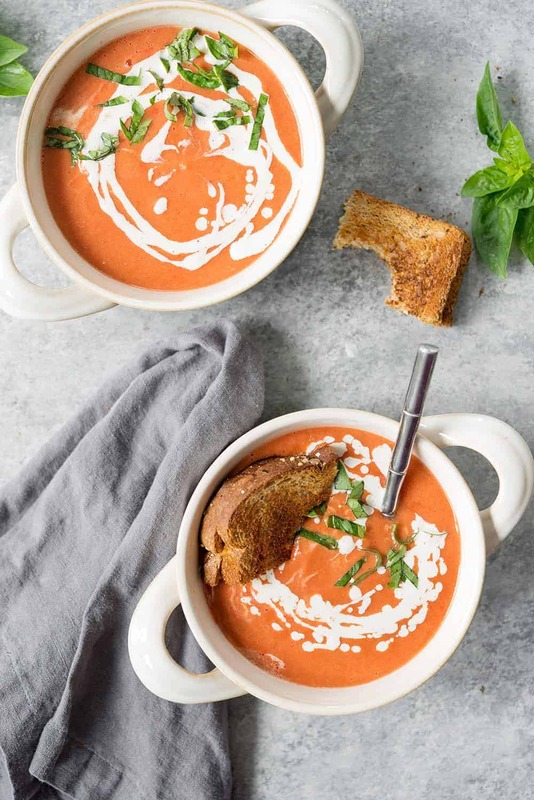 with the tomatoes break down and be as smooth as your soup looks? or should I blend them ?? This soup was so delicious and easy to make!! Love the cashew cream drizzled on top!! Awesome! Glad you liked it- thanks Ashleigh! Alex, I made this last week and we really liked it! I had not made cashew cream before, and was amazed at how easy it was! I did need to use the larger quantity of cashews and water in my Vitamix, but it turned out so smooth! I have some soup in the freezer, and we’ll finish the rest today. Thank you! So glad you liked it! Thanks Connie! It’s a can of tomato sauce that you can find in the same section of the grocery store where you find diced tomatoes, crushed tomatoes, ect. You could use marinara, but that has other spices and may not work quite the same way in this recipe. My favorite brand (not sponsored at all!) is Hunt’s!